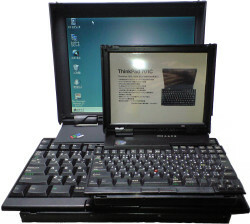 It is the scale model created in commemoration of the 10th anniversary of ThinkPad in 2002. This model not for sale. It was distributed as a gift when purchasing IBM PC or in event. It's a kit and it's necessary to assemble. 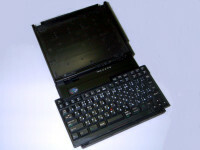 After an assembly finishes, 65% sized ThinkPad is made. 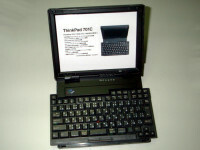 This scale model has the TrackWrite keyboard also. When you insert picture into display, this model becomes photo stand. 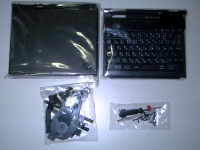 You can assemble it easily if you have an experience assembling plastic model. 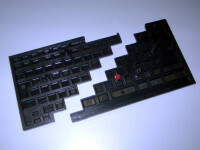 It's a little difficult in assembling the TrackWrite keyboard parts. Parts are in this box. Parts divided into small plastic bags are in the box. 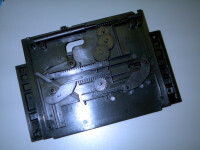 Keyboard parts are separated as same as real machine.